Creating a presentation is a key element for many positions these days whether you're an executive, speaker, or working in a professional setting. Getting your message across in a concise and visually appealing manner is a challenge for many people—but it doesn't need to be. We've put together the ultimate guide to creating a presentation in Canva to help you feel confident and make the best impression while communicating successfully. Creating a style that works with your content and not against it is important. Your audience will appreciate a presentation that's easy on the eyes and flows from slide to slide. Jarring the presentation with multiple images isn't necessary. Use the same 'banner' or title font throughout your design. Have the same 'frame' or 'grid' throughout your design. Apply the same background throughout your design. Create a template page for your presentation to keep all the points above about consistency in line. Take a cue from nature with beauty in repetition. Making one fantastic slide and repeating enables the viewer to pick up other elements of your presentation without having to rethink each slide separately. Canva's presentation templates come in multiple pages, with each page designed to reflect the selected theme. Check out Red and White Restaurant Elegant Presentation and Dark Green Interiors Photo Residential Architecture Presentation to start, and tweak as needed. Your title slide is your calling card for the whole presentation and should convey the overall feeling of your presentation. It should entice people to listen through the whole presentation. Take, for example, Guy Kawasaki's 10 Disruptive Quotes for Entrepreneurs presentation, above. At a glance, the title page brings to mind growth and change. This simple but powerful presentation has earned 365,816 views over time—and almost 275,000 people have embedded it into blog posts. These templates, Red Modern Marketing Presentation and Orange Colourful Brush Strokes Creative Presentation, feature strong title pages that immediately grab your audience's attention. The Pasta Dishes Photo Collage Wide Presentation and the Springtime Mother and Daughter Wide Presentation may have a simple color palette with minimal text, but still packs quite the punch. 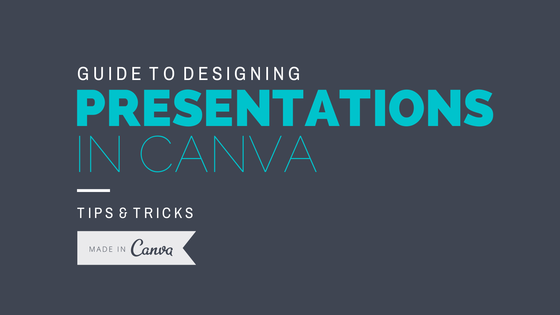 When you're ready, you can present directly from Canva. Click on Publish and choose the suggested option Present. Under the Present option, you can further enhance how your presentation will look. Choose a transition style, or how the presentation will look when you move from one slide to another. You can also choose to manually move the slides yourself, or set it to move forward automatically. A cool feature of Canva's Presentation mode is the Presenter view, where you have a screen to view your notes, a timer, and preview of the upcoming slides. No more messy notecards or papers to help you remember what you need to say. Canva Presenter View with notes, timer, and slide previews. There is a separate window that your audience will see. Sharing your presentation post event? Canva's got you covered. You can download the design in various formats including PDF, or share it through the various social media channels. There's even an option to share as a website!